Our comfortably furnished one-bedroom apartment, consisting of living room with a double bed, fitted kitchen, dining and sitting area, flat screen TV, stereo, free Wi-Fi, a shower room and a terrace overlooking the mountains. The apartment includes a parking space in the underground car park (double parking, max. Vehicle height 150cm). For bicycles and sports equipment (such as skis and toboggans) separate rooms are available. The entire complex includes a sauna (fee required) and a laundromat and dryer. On request, a bread delivery service will also provide you with your favorite sandwiches so that you can start the day relaxed with a good breakfast. The price includes the guest card Bad Hindelang PLUS. This offers a variety of inclusive services. In winter, the ski resort Iseler in Oberjoch with three 6-person chairlifts, a child-friendly 8-seater chairlift and the Ideallift, the Spieser lifts and the Sonnenhanglift in Unterjoch and the Kreuthlift in Bad Oberdorf are available free of charge. Also, the free use of the 8-person gondola Hornbahn Hindelang with three well-prepared toboggan runs and a beautiful panoramic winter hiking trail included. In summer, all cable cars on the Iseler and Imberger Horn are at your disposal free of charge, through which you can effortlessly ascend to various wonderful alpine hiking areas. In addition, you have free access to the natural pool in Bad Hindelang, the tennis hall and tennis courts in Bad Hindelang free use, for 4 hours in the adventure Wonnemar in Sonthofen free swimming (the sauna world and the health bath are available at an additional cost) and have free for 3 hours into the adventure pool Alpspitz-Bade-Center in Nesselwang. 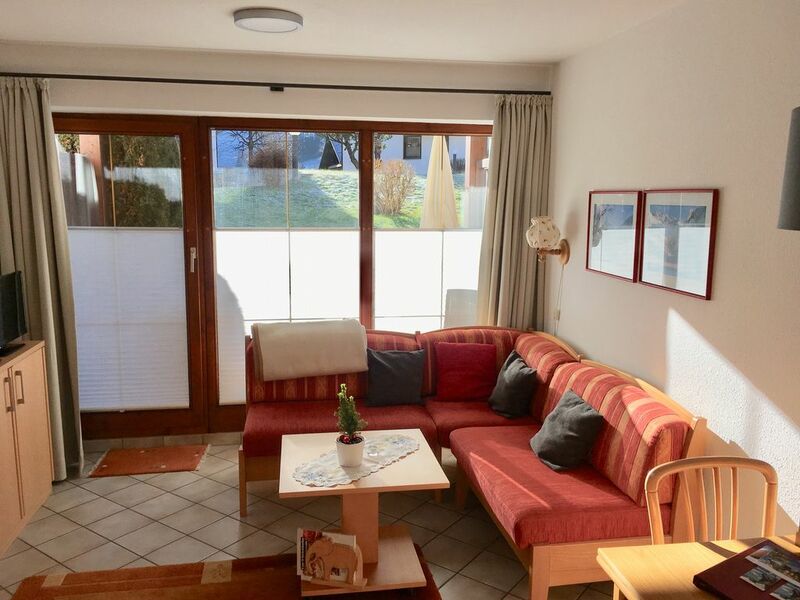 In addition, you park free of charge in all parking lots in the community and have free travel by bus in the entire southern Oberallgäu to Oberstdorf and Kleinwalsertal or to Tyrol Tannheimer Tal. Thus, the apartment with its central location offers the ideal starting point for various excursions. A tourist tax of € 2.10 per day and person and € 0.90 per day and child up to the age of 16 are included in the price under management fees. Children up to the age of 6 Year of age are exempt from the tourist tax. The apartment is very quiet on the outskirts. The center can be reached within a few minutes. Restaurants and shopping opportunities are within easy walking distance.